As of yesterday we seemed to have bypassed spring and went straight to summer. It is hot. Not like a middle of a heat wave hot, but to go from 10°C to 28°C within the span of a day or two makes it feel hot. It’s totally reinforcing why I hate summer and my annoyance with living in a country where it seems we get winter or summer. Both autumn and spring seem to last a total of a week which is so disappointing because they are my favourites. So this week the packing list is another visit to my number one place that I would like to move to. A place that doesn’t get extremely hot in the summer (unless of course the obvious heat wave) and tends to lean towards more spring, or fall for summer temperatures. 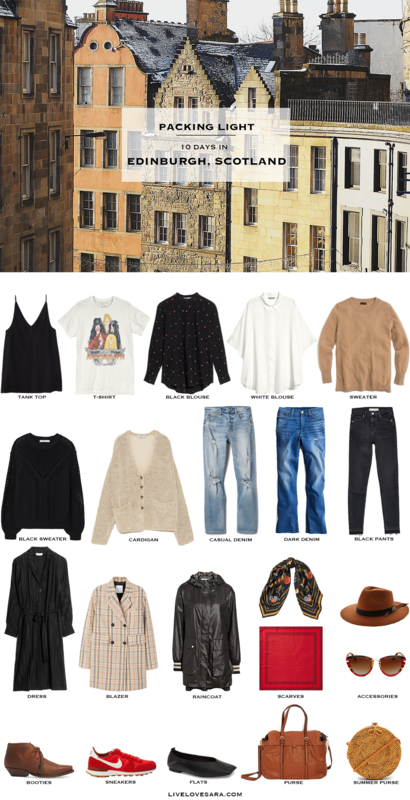 Edinburgh is one of those cities that can experience multiple seasons in one day so it’s best to be prepared. The person who requested this list is going for 10 days in July, and this includes going to The Cure concert in Hyde Park (I love the Cure and that will be an epic concert). Being prepared for unexpected weather means packing layers, and including a waterproof/windproof jacket that you can throw over your shirt or sweater to keep dry because rain is pretty much a guarantee. I have read repeatedly that sandals won’t be a good choice because you won’t wear them, so pack like you would for spring/early autumn with some summerish options that will cover you in case a hot day or two pops up. A couple of blouses (one short, and one long sleeve), a t-shirt, a tank/camisole, a couple of sweaters, and a cardigan should be enough pieces for the top half of your body. Several pairs of trousers or jeans for the bottom. A dress, and blazer/lighweight jacket, and a waterproof Mac to round it out (some cheaper raincoats here and here). For shoes I included some bright coloured sneakers, a pair of leather flats with a bold square toe, and a short, brown, lace-up bootie that is a nice change from a regular Chelsea boot. Accessories are whatever you normally wear like a hat, or a few scarves in bold colours or prints to add some visual fun, and a purse or two. I selected a regular shoulder bag, as well as a woven bag to add some extra summer to the look. This is the bag that I actually bought myself for this season and have waited impatiently for, for the last 3 months due to a backorder. It’s now waiting for me to pick it up from the post office tomorrow so I’ll let you know how it is. Awww, thank you so much for posting this. I had a feeling I’d be packing layering items with some. This will help me not to over pack, but I’m surprised there was no leather jacket thrown in the travel capsule…. too heavy for that time of year?